I like to eat. I sometimes like to cook. I always like sharing my favorite recipes. This stuff is addicting. 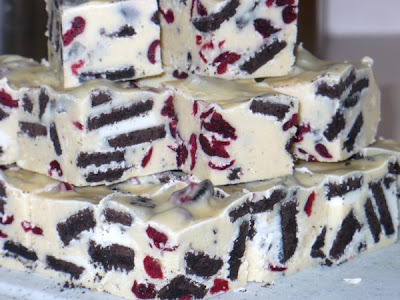 I added sweetened dried cranberries to make it more festive for the holidays. You do not have to add the cranberries if you don't want to. But if you leave out the cranberries, I'd recommend adding a few more Oreos. Line an 8x8 square baking dish with aluminum foil. Chop or break Oreos into quarters (cookies will likely break into smaller pieces but that's okay). Shake out broken cookies in sieve or small-holed colander to remove smaller crumbs. In a medium saucepan over low heat, combine sweetened condensed milk and chocolate chips; stir until chips are completely melted. Remove from heat and stir in cookies and cranberries. Pour into baking dish and refrigerate until firm (at least 2 hours). Pull fudge out of dish and remove foil. Cut into individual-size pieces. 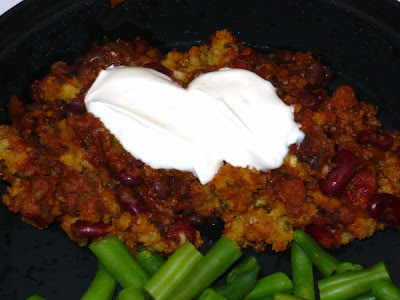 I adapted this recipe from a box of Stove Top cornbread stuffing mix. I had made the original before and didn't quite like the outcome, so this time I adjusted it a bit. Now, in the recipe I'm posting, I suggest simmering the chili for at least 45 minutes. That's because I don't like chewy ground beef. Simmering it for a while softens the beef and makes it more palatable to me. It also reduces the liquid in the chili. You do not have to do the simmer - but understand that your casserole will be a little more gooey - which is not necessarily a bad thing! Also, you could sub 1 1/2 cups of salsa (for a total of 2 1/2 cups in the recipe) if you don't have the diced tomatoes and green chiles on hand. 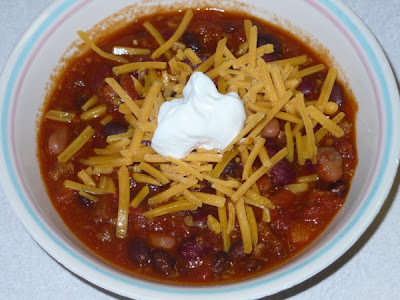 This is a great recipe for a cold night! In a large skillet, brown ground beef with onions; drain. Add beans, tomato sauce, diced tomatoes, salsa, chili powder, cumin, and pepper. Bring to a boil; reduce heat and simmer, uncovered, for 45 minutes. Preheat oven to 350 degrees. In a medium bowl, pour hot water over stuffing and fluff with fork. Pour chili into 9x13 casserole dish. 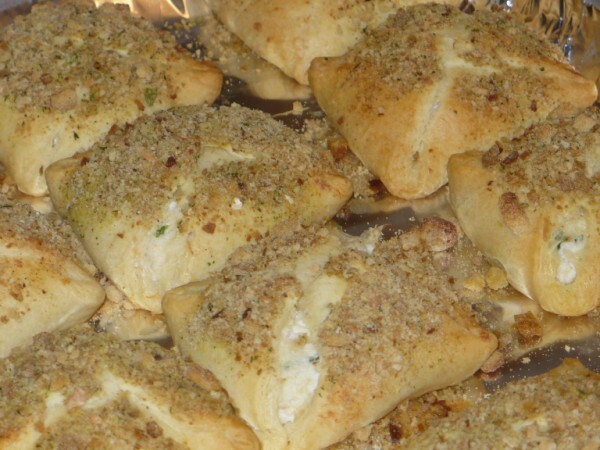 Top with stuffing. Bake for 30 minutes. Serve with shredded cheddar cheese and sour cream. Caralie and I really love these cookies. They taste great and keep their shape when baking. This is the recipe to use if you have cookie cutters with distinct shapes (like an angel) that you don't want to turn into a blob in the oven. I didn't have a problem with the dough being too sticky, but I live in a dry climate. Just use flour on your work surface and rolling pin as needed. In a large bowl, cream sugar and butter. Add cream cheese and beat until fluffy. Beat in egg and extracts. Slowly add flour and baking soda, blending well after each addition. Cover dough with plastic wrap and chill for at least one hour. Preheat oven to 350 degrees. Lightly flour work surface. Dividing dough in thirds, roll out first third to no less than 1/4 inch thickness. Dip cookie cutters first in flour, and then cut dough. 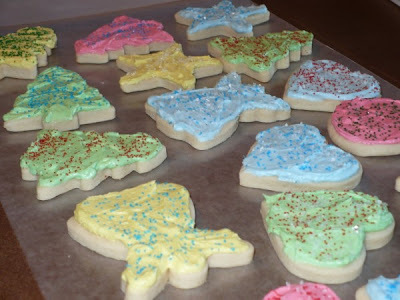 Place cookie shapes two inches apart on an ungreased baking sheet. Bake for 10-12 minutes or until set. Let cool for 3 minutes on sheet then transfer to wire racks to cool completely. Repeat until all the dough has been used. Makes about 3 dozen cookies - depending on cutter size. In a medium bowl, beat shortening with 1 cup powdered sugar with an electric mixer. Add milk and vanilla and beat until smooth. Slowly add remaining 3 cups of sugar until well blended. Beat until frosting is stiff (about 3-5 minutes). Add food coloring. Again, I found this recipe at Allrecipes.com. You can find it here. Sorry I don't have a photo - I forgot to take one. I've changed the recipe a little because I think the original calls for too much rice and a bit too much cheese. I also eliminated the onion because there's already onions in the salsa. But that's just my opinion; you can always use the original recipe. Place rice and water in saucepan and bring to a boil. Reduce heat to low, cover, and simmer for 20 minutes. Preheat oven to 350 degrees. Lightly grease a 9x13 baking dish. In a medium bowl, combine soups and salsa. Spread half of rice in bottom of baking dish. Layer half of chicken, half of soup mix, and half of cheese. Repeat layers. Bake for 30-40 minutes or until bubbly. Serve with sour cream. This could also be a great filler for burritos. My mom sent me this recipe. She found it in Reader's Digest this month. I made it and it's very good - super moist. 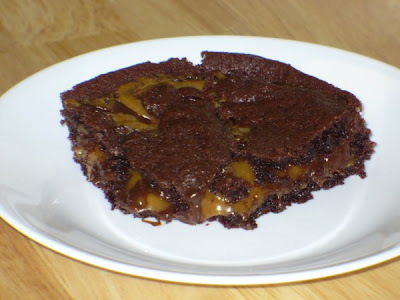 I did not have the exact ingredients called for, namely dark brown sugar and dark corn syrup, so I used their lighter versions but reduced the corn syrup a tiny bit and added a little more molasses. I think that makes up for it...right? Caralie loves this bread and has had it as her afternoon snack all week. Anyway, try this recipe - you won't be disappointed. Unless you're counting calories. Oops. Preheat oven to 350 degrees and line cake pan (about 12 x 8 x 2 inches) with aluminum foil or parchment paper (grease foil if using). In saucepan, melt butter over low heat along with syrup, molasses, sugar, fresh ginger, ground ginger, cinnamon, and cloves. 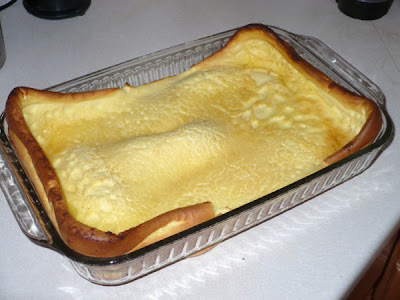 Remove from heat, and add milk, eggs, and dissolved baking soda in it's water (mixture will foam a bit). Measure flour into bowl and pour in liquid ingredients, beating until well mixed. (Batter will be very wet.) Pour into pan and bake for 45-60 minutes (mine was perfect at 45 min. ), until bread rises and is firm on top. Do not overbake; it will continue to bake as it cools. Transfer pan to wire rack and let cool before cutting gingerbread into squares. I got this recipe from my friend Kay. She found it in an issue of Quick Cooking. I make these for showers and stuff - great for brunch. I also make them as a main dinner course. They can be frozen prior to baking. Just thaw in the fridge when you're ready to bake. I've increased the amount of cream cheese called for in the original recipe as the filling could be a little dry. I don't always use the stuffing topping - it can be messy for a finger food when serving these at a party. But if you're making them for dinner, it adds some nice flavor and crunch. In a medium mixing bowl, beat cream cheese, 2 Tbsp. butter, chives, milk, salt, and pepper until smooth. Stir in the chicken. Unroll crescent dough and separate into 8 rectangles; press perforations together. (I then cut the rectangles in half to make two squares - this makes more bundles - follow directions, but use less filling). Spoon about 1/2 cup chicken mixture onto the center of each rectangle. Bring edges up to the center and pinch to seal. Brush with remaining butter. Sprinkle with crushed croutons, lightly pressing down. Transfer to two ungreased baking sheets. Bake at 350 degrees for 20-25 minutes or until golden brown. The recipe suggests freezing one baking sheet and baking the other. That way you have another meal ready for a later date. If you make the bundles with a full rectangle of dough, one bundle equals one serving. If you cut the dough in half, like I do, two bundles would equal one serving (or one bundle for a kid). Either way, you serve 4 or 8, depending on whether you freeze half of the bundles or not. 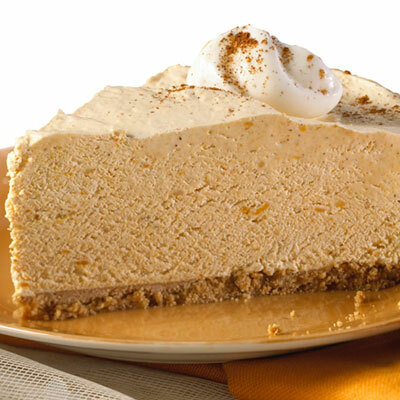 So this is a fast and easy pumpkin pie. Essentially pumpkin pie with the Cool Whip already mixed in. It calls for a graham cracker crust, which is fine, but I think shortbread would be better. Or the best might be a pre-baked pastry pie crust (I like Mrs. Smiths brand best). I also found Pumpkin Spice flavored Jell-o pudding so I used that instead of vanilla. You can find the original source of the recipe here. In large bowl, beat milk, pudding mix, and spice with wire whisk for 1 minute (mixture will be very thick). Whisk in pumpkin. Fold in whipped topping. Spread in crust. Refrigerate at least 2 hours. Store in fridge. I don't actually follow a recipe when I make chili. It's more like I dump stuff in the pot and hope it turns out good. I made some for my in-laws to take to a get-together and apparently it was a hit. So, I'm writing a "recipe" of what I did that time around. Combine all ingredients in a slow cooker and cook on low for 5-6 hours. Can also cook on the stove in a large pot - simmer, covered, for 2-3 hours. I made this tonight and it was DELISH!! One good thing to remember (which I didn't tonight, of course) is to pound out your chicken breasts until they are an even thickness so they cook evenly. I used Prego's Italian Sausage and Garlic sauce and it was really good. Coat bottom of 13x9 baking dish with pasta sauce. In small bowl, beat eggs. In shallow dish, mix Parmesan and bread crumbs. Heat olive oil in large skillet over medium heat. Dip chicken breasts first in egg, and then coat in bread crumb mixture. Place in skillet and cook for 5 minutes on each side (or until breasts are golden brown and cooked through). 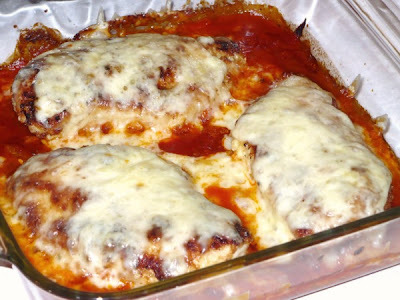 Layer breasts on sauce in baking dish. 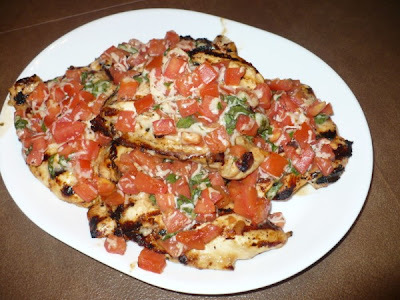 Place or sprinkle Monterey Jack over chicken breasts. Bake for 15-20 minutes or until cheese is melted and bubbly. This is a crappy picture. Some day I will be rich and will have a DSLR and take beautiful photos, but for now, you'll have to deal with my flash. I found this recipe on Allrecipes.com and thought it sounded good. You can find it here. I made it differently because I had rapid-rise yeast and did not use a breadmaker. I'm learning that I don't really need a breadmaker since I have a Kitchenaid mixer that does the hard work for me. So if you have a stand mixer or want to do this by hand, follow my directions. If you want to make it in a bread machine, use the original. Either way, it's very good. Be prepared: this is a dense bread. I reduced the amount of molasses by half. This way there is just a hint of the molasses flavor. If you want more, use the full amount in the original recipe (1/2 cup). I also switched the flour and used mostly whole wheat flour to make these healthier. And I use a candy thermometer to measure the temp of my water. Mix dry ingredients (including yeast) in a medium bowl. In mixer bowl, combine water, oil, molasses, and honey. Pour in dry ingredients. Using dough hook, turn on mixer on lowest setting until all ingredients are incorporated, adding additional flour as needed until dough no longer sticks to the bowl. Increase speed to second setting and let "knead" for 10 minutes (a higher setting can strip the gears in your mixer). Let dough rest for 10 minutes. Shape dough into a loaf and place in greased loaf pan OR divide dough into 12 rolls and place on greased cookie sheet. Cover and let rise until doubled in size. For loaf, bake at 350 degrees for 30 minutes. For rolls, bake at 375 degrees for 21 minutes. 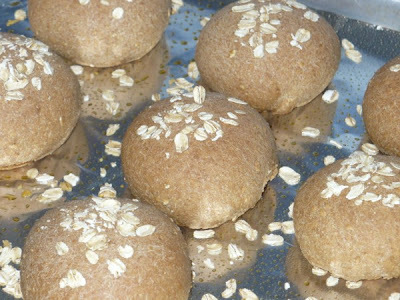 I sprayed my rolls with cooking spray and sprinkled them with oatmeal. Most of it fell off, but I liked the way they looked! This is a cheater recipe. I got it off a box of Stove Top chicken stuffing. Did you know that each box of Stove Top has 3 recipes on the back? And they're not half bad? I did alter it a little, of course, because I can never leave well enough alone. If you want the original, go buy your own box! Steam broccoli for 5 minutes. Meanwhile, prepare stuffing as directed on package and set aside. 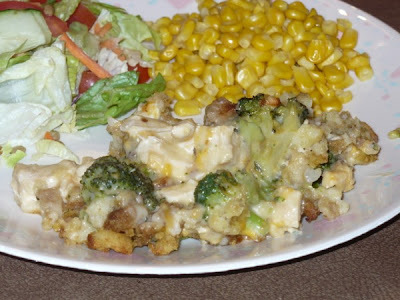 Layer chicken in bottom of 9x13 baking dish; top with broccoli. In a medium bowl, combine soups, milk, and cheese; pour over chicken and broccoli. Top with stuffing. Bake at 400 degrees for 30 minutes or until bubbly and golden brown. Preheat oven to 400 degrees. Prepare stuffing mix as directed on package; set aside. Mix chicken and broccoli in 13x9-inch baking dish. Stir in soup, milk, and cheese; top with the prepared stuffing. Bake 30 minutes or until heated through. It uses raw chicken and I just don't think 30 minutes would make me feel safe to eat it. It uses frozen broccoli and no matter what I do (thaw it, drain it) it always manages to be soggy and wet in the dish. Fresh is better! There is not enough sauce for me: the stuffing dries it up a bit. I'm lucky in that my mom-in-law cooks massive quantities of chicken breast, dices it, and stores it in the freezer in quart-size bags. So all I have to do is thaw it in the microwave. I will be sad when I have my own house and no one to do that for me! Yes, I'm a spoiled brat. I wish I could take credit for creating this delicious recipe, but alas I am not that gifted. 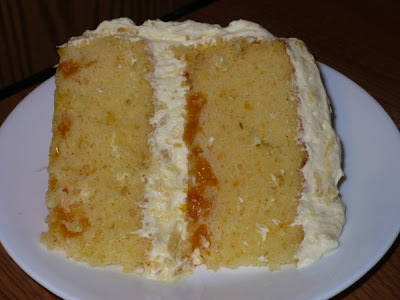 I discovered it on Allrecipes.com and here is the link. I'm also posting it on here with my slight alterations. I think this could just as well be made with boneless pork chops. I doubled the gravy because I had two tenderloins, but that makes a lot of gravy. So if you double, be sure to serve this with rice or mashed potatoes to use it up. 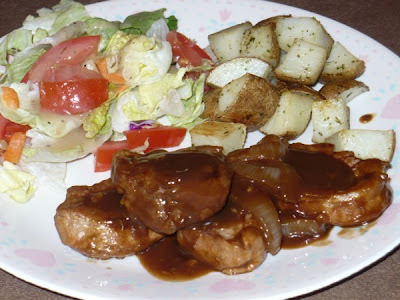 In a small bowl, combine gravy mix, 1/2 cup water, soy sauce, vinegar, and garlic; set aside. In a large skillet, brown pork in oil on medium to medium-high heat until browned on both sides; remove pork from skillet. Carefully add 1/4 cup water to skillet to deglaze pan. Add onions and cook until translucent. Return pork to skillet and pour in gravy mix. Stir and bring to a boil; reduce heat, cover, and simmer for 10-15 minutes or until pork is done and gravy is thickened. I first made these with my friend Pam in high school. Not sure where we got the recipe from. The original calls for German chocolate cake mix, but I prefer Devil's Food. Up to you! Once again, these are very good and very bad for you! I think they taste better and cut better the next day. And the day after that, if they last that long. Preheat oven to 350 degrees. Spray a 13x9 baking dish with non-stick cooking spray and set aside. In a medium bowl, combine cake mix, butter, and 1/3 cup evaporated milk. Mix well and spread 2/3 of the batter into the prepared pan (batter will be thick). Bake for 8-10 minutes. Cool. 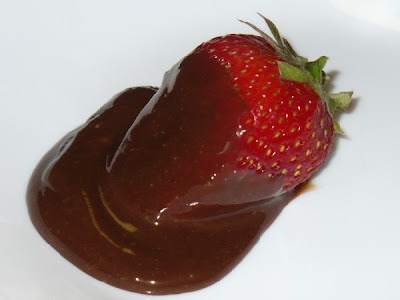 In a medium microwave-safe bowl, combine unwrapped caramels and 1/3 cup evaporated milk. Microwave on high for 2 minutes, stirring twice. Microwave for additional 30 second intervals until caramel is smooth; pour over cooled "crust." Sprinkle with chocolate chips and top with tablespoonfuls of remaining batter (it will not entirely cover the top). Bake for another 15-18 minutes; cool. Cut with a wet knife, if necessary. This is currently cooking in my oven and it smells so good. Perfect meal for a cold day - prepare it in the early afternoon and let it bake all day until dinner time. Thanks, Mom, for the recipe! Preheat oven to 225 degrees. 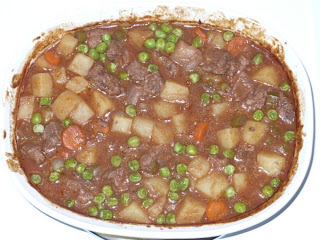 Place meat in bottom of deep casserole dish. Layer veggies in order given starting with carrots. Sprinkle with tapioca, sugar, salt, and pepper. Pour soup + water over top, cover, and bake for 5-6 hours stirring once or twice. Add frozen peas 30 minutes before end of cook time. Stir and serve hot. I tried out the recipe found here (or scroll to the bottom of this post). It made decent noodles. Ours were very interesting since I let my 5 year old do a lot of the work. 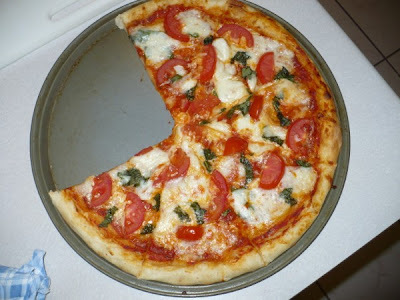 We used a pizza cutter to cut out the noodles - much faster than a knife. And yes, she was supervised during the cutting! Caralie and I just dumped them all on the cookie sheet and guess what? They all stuck together. 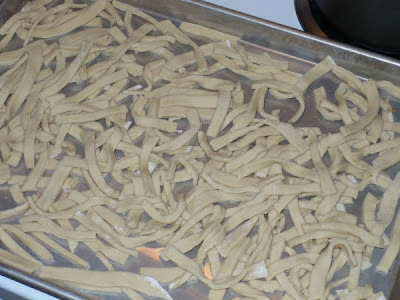 So when drying the noodles (which is not really necessary), make sure you spread them apart. In medium bowl, stir flour and salt. Add egg and milk and stir until dough forms. Knead on lightly floured surface until smooth. 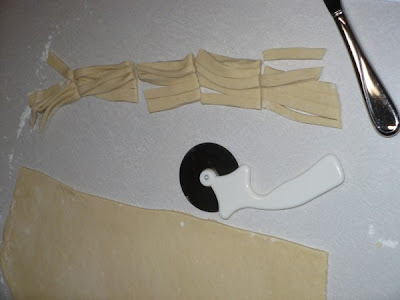 Roll out to desired thickness (thicker for dumplings, about 1/8" for noodles) and cut into desired shapes. Allow to dry as you prepare your broth/soup. Drop into boiling soup and cook until tender. Time will depend on thickness of dumplings/noodles and how dry they were. 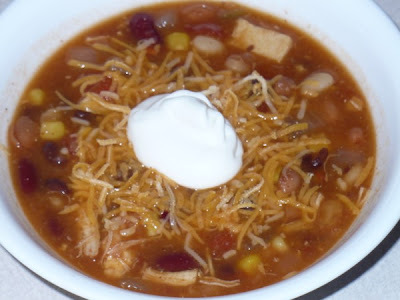 I will probably be posting a lot of soup recipes in the future as it is finally beginning to be fall-like here in AZ and soup is one of my favorite dishes. This one is very thick and filling. When reheating it the next day, be sure to add some water or milk to thin it out a bit. I recently took this to our Relief Society's Super Saturday. In a large saucepan, combine rice, contents of seasoning packet, and water; bring to a boil. Reduce heat, cover, and simmer for 10 minutes, stirring once. Stir in broccoli, carrot, and onion. Cover and simmer for 5 minutes. Stir in soup and cream cheese. Cook and stir until cheese is melted. Threw this together last night. Caralie thinks it's "disgusting" but that's just because she doesn't like potatoes unless they are of the french fry variety. My father-in-law enjoyed it and I rather did too. 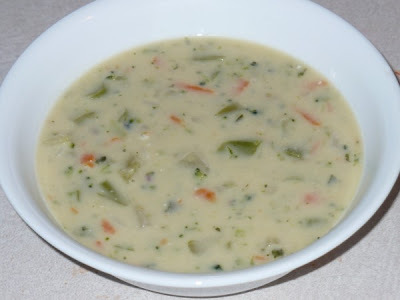 When reheating this soup the next day, add milk as the soup thickens significantly once stored in the fridge. In a medium sauce pot, combine water and potatoes and bring to a boil. Reduce heat, cover, and let simmer 12 minutes or until potatoes are tender. Do not drain. Meanwhile, in a large stockpot, melt butter over med-high heat. Whisk in flour and cook for 2 minutes, stirring constantly. Reduce heat to medium and slowly whisk in milk. Bring to a boil, stirring frequently. Boil for 5 minutes. Remove from heat and stir in cheese. 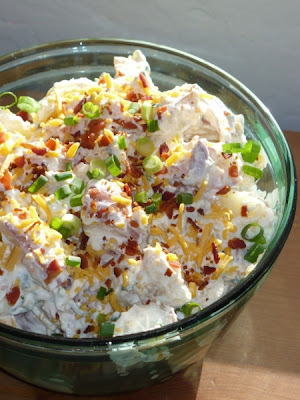 Add potatoes and water, onions, bacon, sour cream, pepper, and salt. Use a potato masher or whisk to blend soup but leave chunks of potato for texture. *I usually only peel half of the potatoes because I like having some skins in the soup for texture. This recipe will feed a crowd. The pan in the picture is larger than a 13x9 baking dish, to give you an idea of how much it makes. Halve the recipe if you don't want lots of leftovers when feeding a small family. Use lowfat or fat free ingredients if that makes you feel better. Cook macaroni according to package directions. Drain. Preheat oven to 350 degrees. In a large bowl combine cheddar, cottage cheese, sour cream, Parmesan, milk, a dash or two of hot sauce, and salt and pepper. Fold in macaroni. Pour into large baking dish (this will barely fit into a 13x9) and bake for 35 minutes or until hot and bubbly. I highly recommend the hot sauce. I'm not asking you to make it spicy, just give it a little kick. It brings out the flavor of the cheeses. But know your hot sauce! If it's super strong, just put a little in. Preheat oven to 350 degrees. Grease and flour a 9x5 loaf pan. In a large bowl, cream together the butter and sugar. Mix in applesauce, cinnamon, and packets of oatmeal. Stir in eggs one at a time, beating well after each addition. Mix in the baking soda and flour. Fold in the apple. Pour batter into prepared pan and sprinkle with oatmeal, if desired. Bake for 60 minutes or until toothpick inserted into center comes out clean. *I tried 3/4 cup all purpose flour and 3/4 cup whole wheat flour and it turned out great, if you want to health it up a bit. I made this on Sunday and it turned out pretty good. The dumplings are more biscuity than noodley, so depending on how you like your dumplings, you may or may not like this recipe. 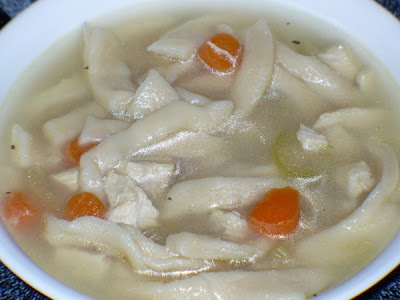 If you have a good recipe or suggestion on making dumplings, please leave a comment and I'll publish it on this post with your first name to give you credit. As always, share the wisdom! ground black pepper to taste. In a large stockpot or Dutch oven, combine soup, broth, and milk. Add onion, celery, carrots, chicken, basil (if using), and pepper; bring to a boil, reduce heat to low and simmer for 30-45 minutes. Remove chicken from pot and shred or chop into bite-size pieces; return to pot. At this point the sauce is runny like a soup. If you like it thicker like a stew (like I do), you can thicken it with a mixture of equal parts cornstarch and water. Just don't make it too thick, because the dumplings will absorb much of the liquid. To make dumplings: In a medium bowl, combine flour, baking powder, and salt. In a small bowl, mix together the 1/2 cup milk and vegetable oil; pour into the dry ingredients, stirring just until moistened. Drop tablespoonfuls (I use a small cookie scoop) of the dumpling mixture into simmering chicken stew. Cover pot tightly and bring to a boil. Simmer for another 12 -15 minutes. Serve hot. I found this recipe in our newspaper today. I think it sounds delish, so I thought I'd share. In a large bowl, blend cream cheese and sugar until smooth. Add pumpkin and spice and blend thoroughly. Serve with sliced apples or pears, graham crackers, gingersnaps, or sugar cookies. Can be spread on bagels or toast. Refrigerate leftovers. Makes approximately 4 cups. Combine all ingredients in large stock pot. Bring to a boil, reduce heat and simmer for 30 minutes. Top servings with shredded cheese and a dollop of sour cream. Another great recipe from a lady I used to work for. This is not good for you, therefore it tastes divine. Use a large saucepan to prevent boiling over. Melt the butter over medium heat. Whisk in remaining ingredients except vanilla. Bring to a rolling boil and boil for 7 minutes, stirring occasionally. Remove from heat and stir in vanilla, if desired. If sauce is not creamy and smooth, poor hot mixture into a blender and blend for 2-4 minutes, with the lid vented to allow steam to escape. Store in the refrigerator. This is great hot fudge sauce for ice cream. 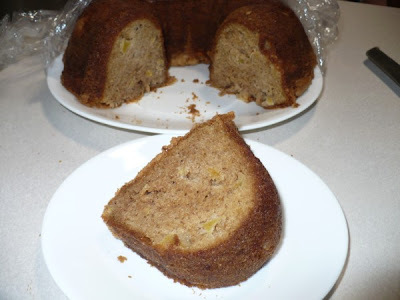 Warm, it's a great fondue for fruit and pound cake. Cold, it's a great dip for fruit. Or whatever else needs some chocolate! Add 1/3 - 1/2 cup chopped onion while you saute the rice in butter. Add 1/4 cup sliced or slivered almonds while you saute the rice in butter. Add 2-3 stalks of celery, chopped, when you add water to the rice. Add 2 cups diced cooked chicken or browned ground beef when you add water to the rice. Add 1 cup fresh broccoli florets during the last five minutes of cooking. You may have to adjust cooking time when adding the celery - sometimes I've found that it needs a couple more minutes to simmer. I haven't tried adding carrots yet, but I bet if you chopped them small enough or shredded them it would work. Please comment with any tricks you have used with the San Francisco Treat and I'll add them to this post so we can all benefit from your excellent wisdom! 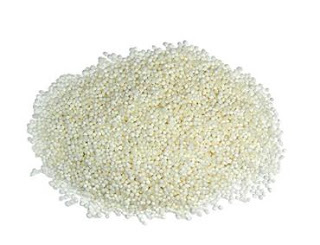 My friend, Becky, suggested browning the rice minus the butter to save on calories. Good tip! Okay, so I need to work on my presentation skills. Clearly I don't know how to drizzle glaze like Martha Stewart. The cake still tastes wonderful. I found this recipe online (as is the case with most of my recipes - I'm not that gifted, myself). I'll be bringing this beaut to the family party on Sunday, in case any of you were wondering. Preheat oven to 350 degrees. In a large bowl, mix together cake mix, eggs, water, almond extract, pie filling, and 1 cup chocolate chips. Stir until just combined. Pour batter into a greased 9x13 baking dish. Bake for 40-45 minutes or until a toothpick inserted in center comes out clean. Remove cake from oven and let cool. Heat 1/2 cup chocolate chips, butter, and milk in a small saucepan over medium heat. 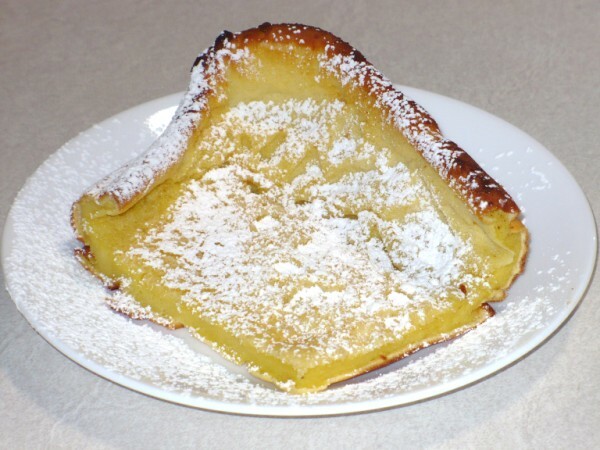 Once chips are melted and mixture is combined, stir in powdered sugar. Drizzle glaze over cake. Now I made this in a bundt pan and I only baked it for 40 minutes and it was just right. If you do go the bundt route, make sure you grease the pan well with shortening. Nobody likes their cake to stick to the pan! I didn't put the 1 cup of chocolate chips in the cake because I accidentally forgot on purpose (I don't like chips in cake). Still tasted delish. I'll put them in for the family party, though. 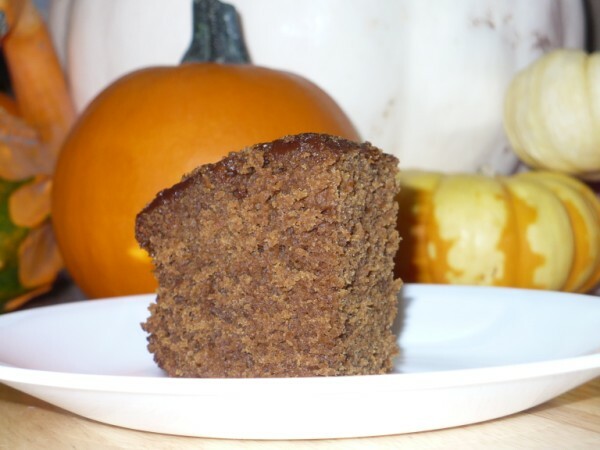 Do make sure you add the full tablespoon of almond extract because that is what makes this cake! Preheat oven to 350 degrees. In a medium bowl or mixer, cream together the shortening, butter, and sugar. Add eggs and vanilla. In another bowl, combine flour, baking powder, and salt; stir into the creamed mixture until well blended. Roll dough into 1 1/2 inch balls and roll in remaining 1/3 cup sugar. Place on ungreased cookie sheet about 2 inches apart. 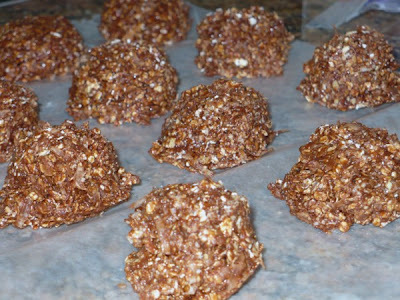 (To make the cookies look like mine above, flatten balls with a glass). Bake 10 -12 minutes. Allow to cool on cookie sheet for 3 minutes before transferring to wire rack. This is one of Caralie's all-time favorites. Probably because ketchup is involved. Preheat oven to 350 degrees. In a large bowl, mix beef, egg, oats, evap. milk, and spices. 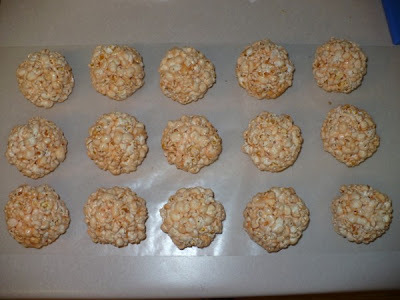 Form into 2 inch balls (I just use an ice cream scoop) and arrange in a single layer in a shallow baking dish (I usually need one 9x13 and one 8x8 glass baking dish). Bake in oven for 30 minutes. Meanwhile, prepare sauce. Mix all ingredients in a small bowl. 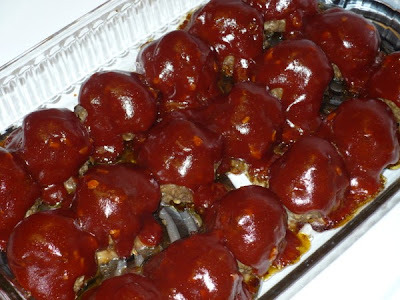 When meatballs are finished baking, pour sauce over meatballs. Return to oven for 15 more minutes. So here it is - my new blog in all it's resplendent glory. I've copied all of my recipes from The Tall Family blog and put them over here. Every recipe is labeled and if you look to the right of the screen, you'll find your search criteria. More recipes to come soon! In 6-qt. saucepot, heat oil on medium until hot. Add carrots, garlic, onion, and pepper; cook 12 - 15 minutes or until vegetables are lightly browned and tender, stirring occasionally. Add cumin, crushed red pepper, and 1/2 tsp. salt; cook 1 minute. 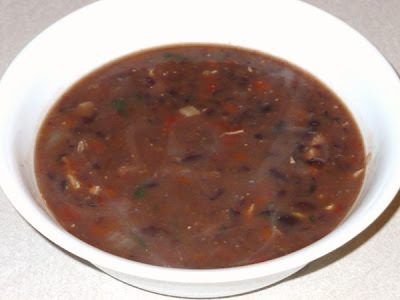 Stir in water, beans, and broth; heat to boiling on med-high. Reduce heat to low and simmer, uncovered, 15 minutes to blend flavors. Ladle 3 cups soup into blender; cover, with center part of cover removed to allow steam to escape, and blend until pureed. Stir puree into soup in saucepot; heat through on medium. Stir in cilantro and lime juice, serve. Makes 6 servings. I had more than 6 people to serve so I used 3 cans of beans, more carrots, more water and broth, more spices. I also added 3 cups of diced cooked chicken after making the puree to beef it up a bit, and the juice of one whole lime. I recommend adding a tsp. of chili powder. This is a good soup, and apparently it's good for you - it's part of Good Housekeeping's "Anti-Aging Diet." Preheat oven to 400 degrees. Spread melted butter in bottom of 9x13 baking dish. Combine remaining ingredients in a blender and pulse until well mixed (you may need to scrape the sides of the blender with a rubber spatula to get all of the flour mixed in). 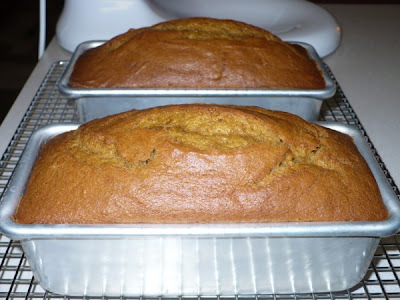 Pour batter into 9x13 and bake for 20-25 minutes or until edges are golden brown. Serve warm, sprinkled with powdered sugar. Preheat oven to 350 degrees. Arrange chicken in bottom of large casserole dish. In a medium saucepan, melt butter over medium heat. Stir in Italian dressing mix, soups, broth, and milk and bring to a boil. Add cream cheese and stir just until melted. Pour sauce over chicken in casserole. Bake for 30 minutes. While sauce is baking, prepare pasta according to package directions. Serve sauce over pasta and sprinkle with Parmesan cheese. Makes 8 servings. *You could also use regular cream cheese and add 1 Tbsp. chopped fresh or dried chives. I have made it many times now and love it more and more each time. Nothing beats fresh basil! It's so refreshing in the summertime. Find the recipe here. Preheat oven to 350 degrees. Beat eggs well. Add sugar 1/2 cup at a time, beating well. Add vanilla and oil. In a medium bowl, sift dry ingredients together. Add flour mixture 1/2 cup at a time, until fully incorporated. Fold in apples. 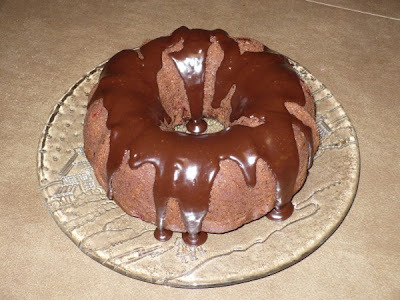 Bake in a greased bundt or tube pan for 1 hour. Cool in pan for 15 minutes and then transfer to wire rack. A 1 lb. bag of pizza dough from Fresh & Easy (or check the refrigerated section of the bakery in your local grocery). Much better than that Pillsbury junk. Just make sure to let the dough come to room temp before trying to roll it out. Just follow the pizza dough directions for baking temp and time. If you want it a little heartier, add some diced chicken. Next time I'm going to try grilling it! 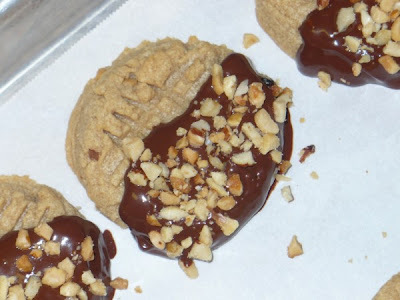 Want to know an easy way to fancy-up some plain-jane peanut butter cookies? Well, too bad - I'm going to tell you anyway. I just melt semi-sweet chocolate chips with a little shortening an dip half the cookie. Then I place them on a parchment lined cookie sheet and sprinkle chopped nuts on the chocolate. Refrigerate the cookies to get the chocolate to set faster. Ta-da! Fancy schmancy cookies! You'll look so gourmet. Preheat oven to 400 degrees. Line a jelly roll pan with aluminum foil. 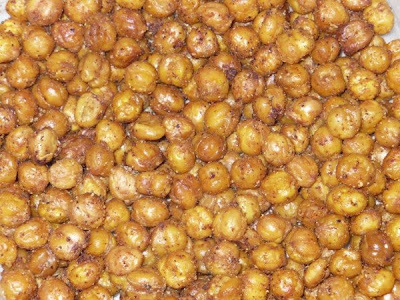 In a medium bowl combine all ingredients until chickpeas are well coated. Spread evenly in pan. Roast for 30 minutes. Remove pan from oven, stir chickpeas, and return to oven and drop temperature to 375. Stir again after 15 minutes. Roast 15 minutes more (total of 1 hour) watching carefully to make sure peas do not burn; remove from oven and allow to cool completely before storing in a Ziploc or other airtight container. You will most likely have a couple of exploding peas. Just be sure to pick them out of your oven once it is cool. The peas start to lose their crunch after the first day (especially in a humid climate), so eat fast. These are like corn nuts and are a great topper for salads. High in fiber and protein and not a lot of fat - excellent healthy snack. If you live in a humid climate I would recommend omitting the oil or only using 1 tsp. You can use whatever seasoning you prefer. Online people have suggested cinnamon sugar, cajun seasoning, sea salt, etc. 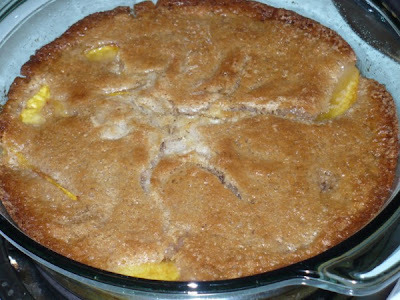 EASY PEACH COBBLER - delish!! Move oven rack to upper middle position. Preheat oven to 350 degrees. Melt butter in 8x8 or 9-inch round baking dish in oven. Mix dry ingredients in medium bowl then whisk in milk and vanilla until well blended. Pour batter in dish and scatter fruit on top. Sprinkle with 1 Tbsp. sugar. Bake 50-60 minutes or until batter browns and fruit bubbles. Serve warm with vanilla ice cream or whipped cream. Double the ingredients to make a 9x13 pan. Use 3 cups any fresh fruit such as blueberries, raspberries, nectarines, etc. Could also use frozen or canned fruit. Thaw frozen fruit before baking. Drain liquid from canned fruit. This is my favorite potato salad (and I don't like potato salad). Place potatoes in a large pot and fill with enough water to cover. Bring to a boil, reduce heat, and cook for about 8-10 minutes or until potatoes are fork-tender. Drain, then cool potatoes in fridge. In a large bowl, combine remaining ingredients. Fold in the potatoes. Refrigerate until ready to serve. 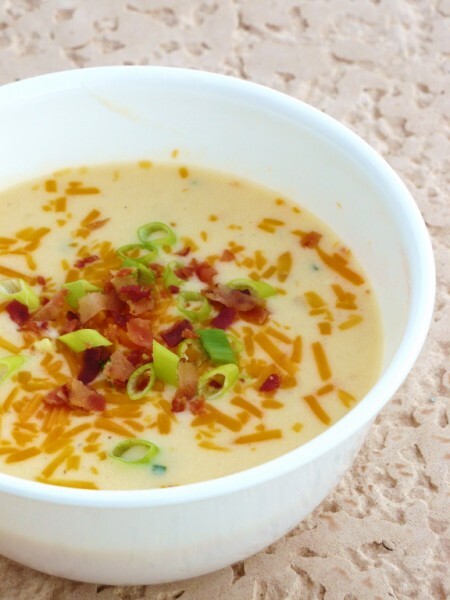 Can be garnished with a sprinkling of cheese, bacon bits, and chopped green onions. Recipe submitted to allrecipes.com by "ElizabethBH"
(posted here with some alteration by me). 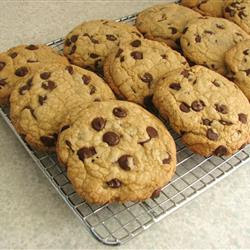 These are the best chocolate chip cookies I have ever had. They look like the ones you buy at the bakery but taste better. They are good for the first three days, but shouldn't be kept longer than that (they probably won't last past day two). I highly recommend using parchment paper on your cookie sheets - cookies won't stick and you don't have to wash your cookies sheets after baking. Less dishes - yay! In a medium bowl, cream together the melted butter, brown sugar and white sugar until well blended. Beat in the vanilla, egg, and egg yolk until light and creamy. Mix in the sifted ingredients until just blended. Stir in the chocolate chips. Refrigerate dough for 15 minutes. Drop cookie dough 1/4 cup at a time (or use a large cookie scoop) onto the prepared cookie sheets. Cookies should be about 3 inches apart. Bake for 15 to 17 minutes in the preheated oven, or until the edges are lightly toasted. Cool on baking sheets for a few minutes before transferring to wire racks to cool completely. Makes about 18 large cookies. 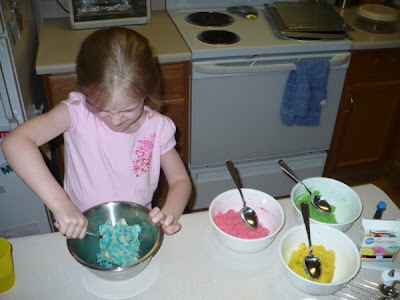 Here is a recipe that Caralie and I made for her preschool class. You can make them into cookie-pops if you want to by inserting lollipop sticks into the cookies before you bake. 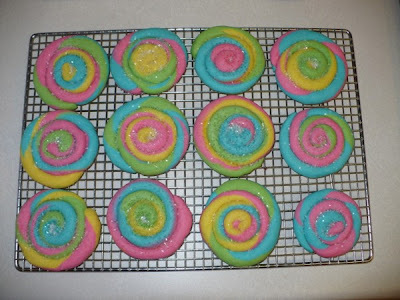 Mostly these are cool-looking cookies, not the most tasty ... though I haven't met a kid yet that doesn't like them! In a large bowl cream butter, cream cheese and sugar until fluffy. Add egg and almond extract; beat until smooth. In a medium bowl combine flour, baking powder, and salt. Add dry ingredients to the creamed mixture. Stir until soft dough forms. Divide dough into fourths. Tint each with a different food color. "Mommy! I'm stirring with all my might!" 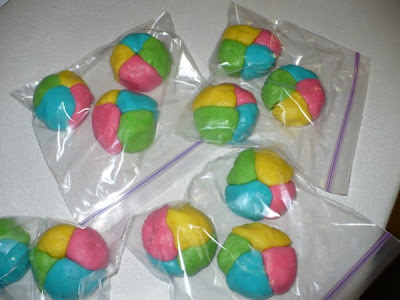 Roll each color into small, 1 inch balls. Combine balls into batches of four and press together to make one large ball. Cover and refrigerate for 1-2 hours. Preheat oven to 350 degrees. Roll each ball into a 12 inch long rope and, starting at one end, coil rope to make a 3-inch round cookie. 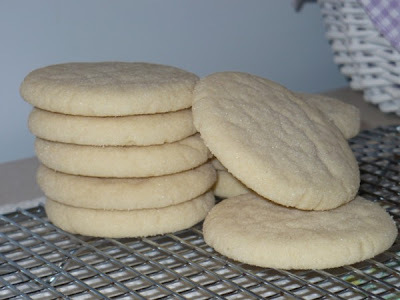 Place cookies 3 inches apart on a lightly greased baking sheet (or use parchment paper). Sprinkle with sugar sprinkles or insert lollipop sticks. 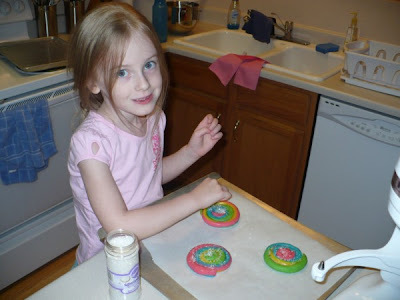 Caralie used sugar sprinkles to make them "pretty." Bake cookies for 8 - 10 minutes or until centers of cookies are set. Cool on a wire rack and store in an airtight container. Makes a dozen cookies. Since it's officially fall I decided to make my favorite autumn treat. The sisters I visit teach will be enjoying this tomorrow. I've always received many compliments on this bread, but I can't accept them because the recipe is not my own. It is from the original Joy of Cooking cookbook. Preheat oven to 350 degrees. Grease a 9 x 5-inch loaf pan. In a medium bowl sift together the flour, baking powder, baking soda, salt, cinnamon, and cloves. In a large bowl, beat sugar, shortening and eggs until light and fluffy. Add and beat in pumpkin. Add the dry ingredients alternately with the milk and vanilla. Do not over-beat between each addition. Fold in the optional nuts/raisins/chocolate chips. Pour batter into pan and bake about 1 hour or until toothpick inserted in center comes out clean. Cool on a wire rack. Remove loaf from pan and wrap with plastic wrap to prevent drying out. I got this recipe out of The Friend magazine a couple years ago. 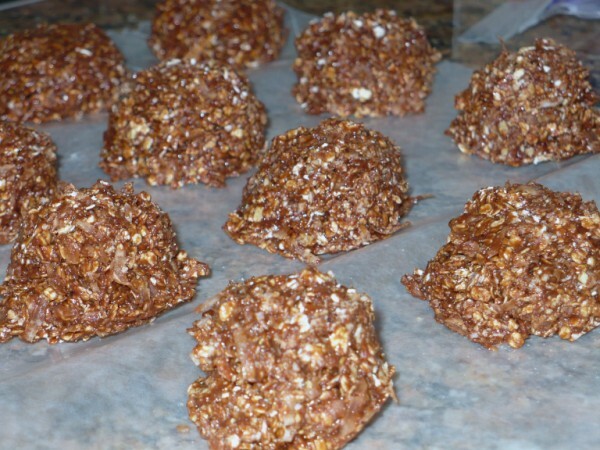 These are my favorite no-bake cookies. Use only milk chocolate chips, not semi-sweet. For some reason these only turn out with milk chocolate. Place chips, butter, and marshmallows in a large sauce pan and melt over low heat, stirring constantly. Remove from heat and stir in vanilla. Mix in oats and coconut. Drop by rounded tablespoonfuls (I use a cookie scoop) on waxed paper and cool. Store in an airtight container. Caralie says this cake smells even better than my armpits. She likes my "armpit cleaner" (deodorant). Preheat oven to 350 degrees. Grease and flour 2 9-inch round cake pans. In a large bowl, combine cake mix, eggs, oil, orange extract, and juice from mandarin oranges. Beat with an electric mixer at low speed for 30 seconds, then medium speed for 2 minutes. Fold in mandarin oranges. Pour batter evenly into 2 pans. Bake for 35 - 40 minutes, or until toothpick inserted in center comes out clean. Allow to cool. Remove from pans. To make topping: In a large bowl, beat pineapple with juice and dry pudding mix until well blended. Fold in whipped topping. 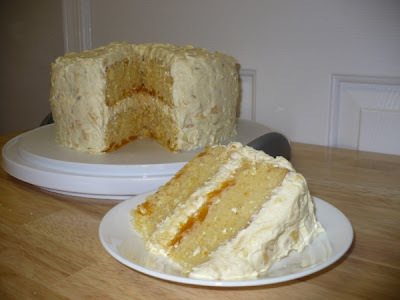 Spread between cake layers and on top and sides of cake. Store in refrigerator. Here's what I do: I use my air popper and a large bowl. A quart of popcorn is 4 cups. 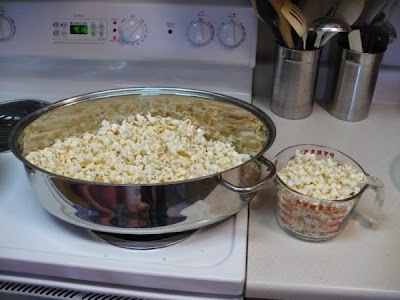 Typically a 1/4 cup of kernels will yield 4 cups of popped popcorn. As the popcorn falls into the bowl, I scoop it loosely with my fingers (to remove un-popped, tooth cracking kernels) and place the popcorn in my 4-cup Pyrex measuring cup. Then I dump that into my large roasting pan. Once I have all 5 quarts, I put the roasting pan in the oven on "warm." In a saucepan over medium heat, combine the corn syrup, butter, cold water, vanilla, powdered sugar, and marshmallows. Heat and stir until the mixture comes to a boil (stir in food coloring, if desired). Take roasting pan out of the oven (use mitts!) and pour syrup mixture over popcorn. Stir until every kernel is coated. Spray a 1-cup measuring cup and your hands with cooking spray. Fill measuring cup with coated popcorn (mine were heaping cup-fulls). Remove from cup and firmly press to form a ball. (This way, they are all the same size). Place on waxed paper to cool. Repeat (adding cooking spray as needed). 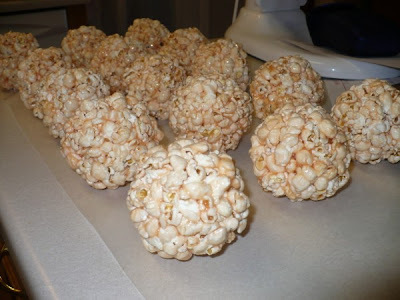 Makes 15 - 20 popcorn balls, depending on size. This is a recipe for REAL caramel apples. As in, you make the caramel vs. melting a bunch of hard little cubes. Don't get me wrong, I'm all for the cubes ... but for me I only use them when I make my "gourmet" caramel apples (ie: caramel, chocolate, and peanut apples) because the caramel hardens faster. 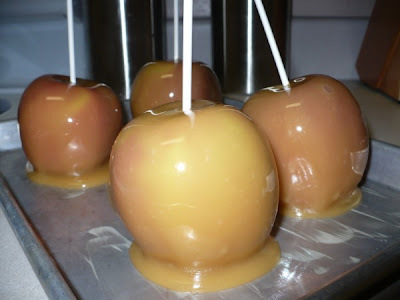 But when it comes to plain caramel apples, I like home-made because you get a stronger butter and vanilla flavor. Mmmmm! I got the idea to make them after someone at the family Halloween party (was it you, Kim?) 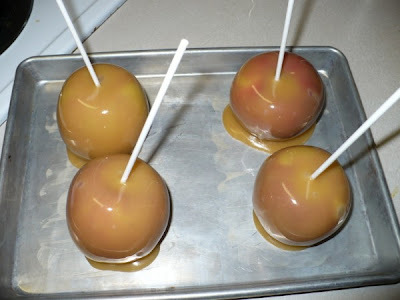 made some killer home-made caramel apples. I ate two in one sitting. I only had 1 cup of cream, so I halved the recipe, but if you follow the recipe as is you can get 8 - 10 apples out of it (depending on size). Now, when it comes to choosing apples, I prefer Fuji apples for their crispness and almost cinnamon-y flavor. I typically don't like Granny Smiths because they can be too tart for me, but I understand why many people prefer them - the tart of the apple cuts the sweet of the caramel. I am tempted to try Golden Delicious because they have the thinnest skins and would therefore be the easiest to eat. But ultimately, just use whatever apple floats your boat. I use a meat mallot to tap the dowel/stick into the center of the apple. Tap it gently and try not to go further than half-way into the apple. Now you're ready to make the caramel! In a large, heavy saucepan, combine the sugar, syrup, and salt. Over med-low heat, bring mixture to a boil and heat to 240 degrees. Stir in butter and cream (the mixture will bubble up). Add vanilla. Return to a boil and continue cooking until mixture returns to 240 degrees (soft-ball stage). Remove from heat and let cool to 200 degrees before coating apples. Place apples on heavily buttered dish or cookie sheet. Refrigerate until firm. I later cut the sticks because they were much too long and looked pretty dumb. Don't you love how "straight" they are? This is why I prefer dowels! 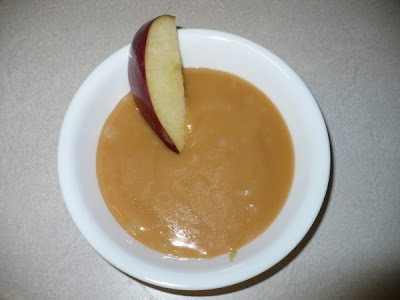 I only had 4 Fuji apples, so I poured the leftover caramel into a bowl and used it as a dip. Super yummy! 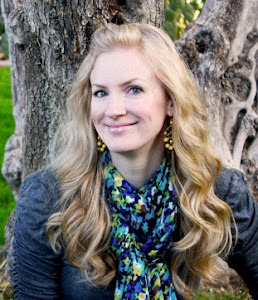 I'm Chanelle, aka The Tall Girl, and welcome to my little food blog! I love trying new recipes and sharing what I like with others. Take a minute, get comfy, and make yourself at home.